Thermal Heating Services are expert plumbers offering heating and plumbing services in Kearsley. With our vast experience and years in the trade, we’re committed to ensuring all work undertaken is performed to the highest quality complimented by our exceptional customer service. We take pride in our work and ensuring our customers are happy is our number one priority. 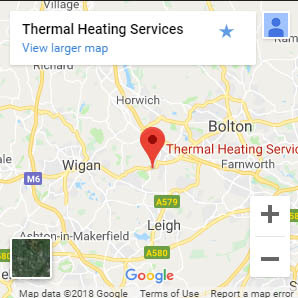 As plumbers and Gas Safe engineers, Thermal Heating Services offer a wide range of services to our customers in Kearsley, including boiler installation/replacement, boiler repair, solar panel installations, leak repairs and central heating repairs and installations. Has your boiler been on the blink? Is it unreliable at the best of times? Our professional heating engineers offer outstanding boiler repairs in Kearsley. Making your life more comfortable at home is our job, we have experience with all the common causes which causes a boiler to break, making us the most experienced plumbers when it comes to boiler repairs. There are numerous issues that can point to a faulty boiler. These can include a lack of hot water, the radiators not heating up as expected or the boiler simply not working when it should. Fortunately, Thermal Heating Services can fix these problems and more so if you’re in Kearsley and need your boiler repaired or serviced, be sure to give us a call. If your old boiler is costing you too much money then you could benefit from a brand new condenser boiler. Many of our customers in Kearsley opt for a combi boiler as it allows for immediate hot water and you no longer need a water cylinder, freeing up room space. Gas Safe registered Thermal Heating Services offer complete central heating solutions from the installation of the boiler right down to the radiators. No job is too big or small so if you’re looking for a replacement boiler or a full new central installation, we will happily take care of it. We’re proud to be able to offer underfloor heating installation in Kearsley as an alternative to traditional heating installations. Many modern households are opting for underfloor heating for both aesthetic and practical values. Without radiators, those limited on space won’t need to worry about having to squeeze a radiator or two in their rooms. For those who prefer minimalism when it comes to household design, there’s nothing more minimalist than underfloor heating! One of the other benefits of underfloor heating? There’s no need for slippers anymore! As heat rises, the heat generated from the water pipes below the floor will spread upwards throughout your room, meaning you can run your underfloor heating at a steady temperature, keeping your home warmer. All our installation work comes with a guarantee so if you live in Kearsley and are interested in having a boiler or heating system fitted, contact us today.